In past posts I’ve discussed how recovery of used motor oil is still in its early stages in Latin American nations such as Brazil and Colombia. But that’s only part of the waste problem generated by the lubricants we use in motor vehicles. There’s also the packaging that the new motor oil comes in, the used oil filters and used oil pans. If not collected, cleaned and recycled or disposed of properly, the residual used oil in them — with contaminants such as cadmium and arsenic — can pollute the soil, groundwater and waterways. In Latin America and the Caribbean (LAC), it is rare for any of these to be collected and reused/recycled, rarer still for it to be done properly. However, there is momentum building in Brazil, albeit slowly, to set up formal systems to recover and recycle the used packaging for motor oil (which in Brazil is mostly plastic, namely high density polyethylene – HDPE). In the US, collection of used oil bottles and cans tends to be done by local (usually county) governments. In Brazil, collection has been organized by the industry, albeit with steady “encouragement” from government. The reasons industry took up the role are several. The industry — the oil majors, service station owners and other resellers of motor oil — might tell you that they set up collection and recycling networks out of a sense of “social-environmental responsibility.” This may be true, but they also did it for at least two other reasons. First, they could see from the CONAMA rules on used oil, a Rio Grande do Sul rule on used oil packaging and growing number of other state and federal rules emphasizing producer responsibility, that they would eventually be called upon to play a role in managing these wastes anyway. They also understood that, under Brazil’s Environmental Crimes Law, they might be assessed penalties for any environmental damages such wastes cause (under Brazilian law, used oil containers can be considered as hazardous waste because of its classification under ABNT‘s official technical norm NBR-10004). Second, they spotted a market opportunity: some service stations were already handing over their emptied plastic oil bottles to informal “recyclers,” who would wash the bottles out with little to no environmental precautions (basically, just washing the residual oil down the drain) and then sell the HDPE to plastic recyclers. By replacing the informal system, they could recapture some of the costs of a formal, environmentally correct collection/washing system that also avoids the environmental damage (primarily to waterways, groundwater and sewage treatment systems) caused by their less careful counterparts. 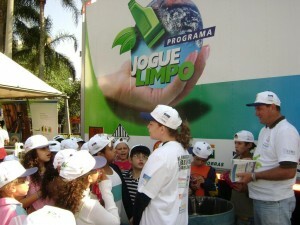 When the trade association representing the major companies* producing and selling motor oil in Brazil, the National Chamber of Fuel and Lubricant Distributors (Sindicato Nacional das Empresas Distribuidoras de Combustíveis e de Lubrificantes – Sindicom), started its Programa Jogue Limpo (“Play Clean Program”) in July 2003 in Rio de Janeiro (RJ), it teamed up with the catadores co-op Riocoop and Metalúrgica Barra do Piraí (now Mauser do Brasil Embalagens Industriais S.A). Riocoop picks up the used bottles from 600 resellers (primarily in the state capital), extracts what used oil it can (which is sent to be re-refined), cleans the bottles and compresses them into bales. Mauser takes them from Riocoop and recycles the HDPE into other products allowed by environmental regulations — primarily new oil bottles (it’s estimated that every new plastic oil bottle produced in Brazil now contains 20% recycled content). Sindicom currently is working to extend the program to the rest of RJ state. In 2005 Sindicom expanded the Jogue Limpo program to Rio Grande do Sul (RS), primarily because in 2003 RS had adopted a portaria requiring recycling of such packaging. Sindicom’s partner in RS for collection purposes is the waste management firm MB Engenharia. The RS operation focused first on the metropolitan area around the capital, Porto Alegre, but now involves some 2,500 resellers from around the state, from which about 50 metric tons (mT) of used HDPE is collected every month. Most of the collected packaging waste is sent to Mauser in RJ for recycling. In 2007 Sindicom expanded the program to Paraná — because they were given no choice. As Paraná environment officials have done with Tetra Pak, long-neck beer bottles, PET and fluorescent lamps, in May 2007 the Environment Secretariat (SEMA) and the state’s Public Ministry (Ministério Público – MP)** told all producers and resellers of motor oil in the state — not just service stations but supermarkets and auto parts stores as well — that they had 60 days to present plans to manage and recycle the wastes — or else. The Paraná version of Jogue Limpo initially focused on 1,100 resellers in the metropolitan area around the state capital, Curitiba, and in Londrina and Cascavel. The program was since expanded to include resellers in over 150 cities statewide bringing in about 220,000 used oil bottles a month. Collection is done by waste management firms licensed by the Environment Institute of Paraná (IAP), including MB Engenharia. PR officials insisted on an aspect of the program that ensures greater participation in the collection scheme: service stations must get a “ticket” from the collection firm proving that they have participated, and must show this ticket in order to get their environmental license (required in order to operate) renewed. 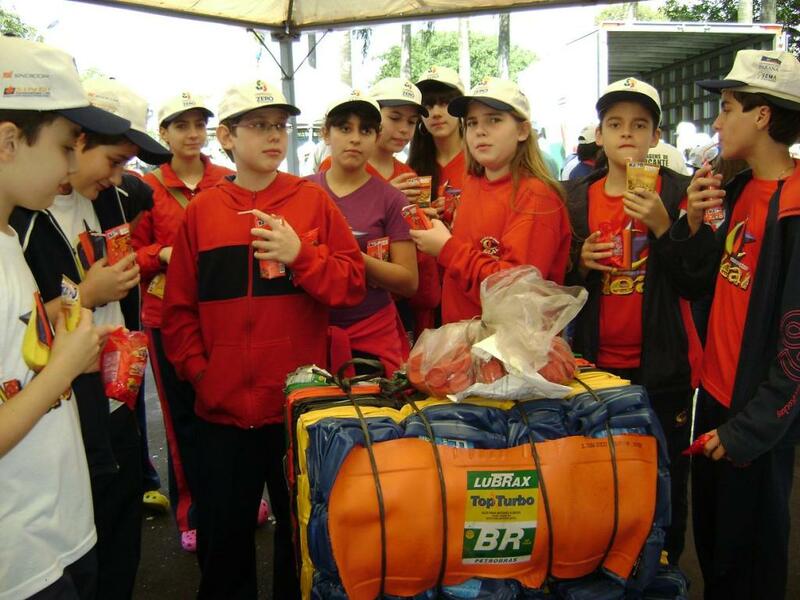 Being Paraná, the roll out of the program has been accompanied by a heavy environmental education component, particularly aimed at children and young people (see pictures). In most cities students instructed in the importance of proper waste management and recycling and are taken through an exhibit showing the life-cycle of motor oil — from its production and packaging, to the point where the collected plastic oil bottles are ground into flake to be recycled and made into new bottles or tubes and hoses used in civil construction. They then are given activities book (printed on recycled fiber) that include games, crossword puzzles, etc. that help reinforce lessons on waste and recycling. Although PR environment officials have repeatedly praised the Jogue Limpo program, they apparently were not pleased enough to stick with a voluntary effort where the industry sets most of the rules, because at the end of November SEMA adopted a regulation setting out detailed rules for used oil packaging take-back in the state. The principal change brought by the regulation is that makes it clear that the resellers participating in the collection program do not have pay for the collection — the producers do. Producers are responsible for ensuring that the post-consumer oil bottles are collected, handled and recycled correctly and paying for the process in proportion to the total volume of motor oil that they sell in the state. Resellers are required to keep records of the motor oil they sell and the post-consumer bottles that they turn in for at least five years. Next is probably neighboring Santa Catarina (SC) state, which in August 2008 adopted a law on the subject. The law calls for consumers to take their used oil bottles to the place that they bought them, and the resellers to accept them, drain them of any residual oil, properly clean them and deliver them to an collection center licensed by SC’s Environment Foundation (FATMA). Manufacturers, importers and distributors of motor oil are responsible for creating the collection centers and ensuring that the collected bottles are either recycled or properly disposed. The law won’t really take practical effect until an implementing decree is issued — that was due in November, but has yet to be published. Meanwhile, the industry would do well to begin preparing for a Jogue Limpo program in the state. 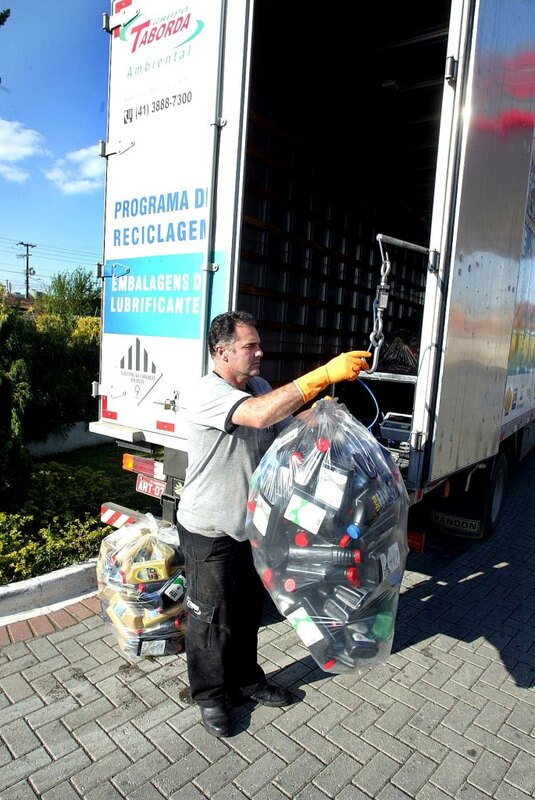 After SC, I would lay odds on a push for oil bottle recycling in São Paulo (SP) state next. It has the most service stations (nearly a fourth of all registered in Brazil), automotive service and repair shops, and motor oil resellers in the nation, the industry already knows well what they must do (the state industry federation published in 2007 a pretty good manual on the issue), the state has a comprehensive waste law whose implementation may eventually require recovery of the used oil packaging, and many service stations there already have their used oil bottles picked up by licensed waste management firms. ** Under Brazil’s 1988 Constitution, the Public Ministries (MPs) at the federal, state and large city levels are empowered to protect the public interest through special investigations and legal actions, including the ação civil pública, where the MP can take on anyone it feels is not complying with current law in specific areas (environment is one), even if it is an environment agency. A região Oeste do Estado agora conta com o recolhimento de embalagens de óleo lubrificante do programa Jogue Limpo. Mais de 540 postos de combustíveis de Cascavel, Toledo, Foz do Iguaçu e outros 50 municípios da região passaram a integrar o programa que deverá coletar mensalmente quase 11 toneladas de embalagens. Nesta sexta-feira (10), o secretário do Meio Ambiente e Recursos Hídricos, Rasca Rodrigues, lançou o programa em Cascavel, durante um evento que reuniu cerca de 2 mil crianças. Segundo ele, atualmente a coleta vem sendo feita em 100 municípios paranaenses – 71 municípios na Região Norte, com o trabalho centralizado em Londrina, e outros 32 em Curitiba e Região Metropolitana. “Com o lançamento do programa na região Oeste, inserimos outros 54 municípios e quase metade do Estado estará integrada ao Jogue Limpo”, destacou. Atualmente, com as duas regionais em atuação, a média de recolhimento é de 177 mil embalagens. Com a inclusão destes novos municípios, a expectativa é, até dezembro deste ano, atingir o número de 220 mil frascos coletados. Até o começo do próximo ano o programa irá abranger todo o Estado, de acordo com o presidente do Sindicombustíveis-PR, Roberto Fregonese. “Assim, no Paraná as embalagens deixarão de ser um fator de risco para o meio ambiente e passarão a ser material para confecção de diversos produtos. Com esta cadeia produtiva sustentável, fazemos a nossa parte”, enfatizou. O Jogue Limpo é desenvolvido pela Secretaria do Meio Ambiente e Recursos Hídricos em parceria com Ministério Público do Paraná, Sindicato Nacional das Empresas Distribuidoras de Combustíveis e de Lubrificantes (Sindicom) e Sindicato do Comércio Varejista de Combustíveis, Derivados de Petróleo e Lojas de Conveniência do Paraná (Sindicombustíveis-PR). COLETA – Como nas demais cidades, será feito um controle mensal do material coletado. O trabalho será feito por empresas licenciadas pelo Instituto Ambiental do Paraná (IAP) para a coleta de resíduos industriais e domiciliares, que vão pesar e recolher as embalagens. Estas informações serão registradas em um ticket, emitido pela empresa, que deverá ser apresentado ao órgão ambiental para a renovação da licença do posto de combustível. O diretor regional do Sindicombustíveis da região de Cascavel, Walter Venson, disse que os postos do município já estão preparados. “Estamos satisfeitos com a participação dos postos de diversas bandeiras que já aderiram ao programa. Para facilitar o recolhimento, estão sendo instalados tambores nos postos, para que os funcionários possam separar o material para a coleta”, comentou. O material recolhido é destinado a empresas de reciclagem, que o transformará em novas embalagens, tubulações e mangueiras para o uso da construção civil. O reaproveitamento evitará que o material seja descartado irregularmente no meio ambiente, o que levaria cerca de 200 a 300 anos para se decompor. CIRCUITO – No lançamento do programa em Cascavel, 2 mil alunos da rede publica de ensino participaram de uma ação educativa com um circuito que mostrou as etapas de fabricação do produto – desde a fabricação do óleo até a reciclagem das embalagens. O que mais chamou a atenção dos estudantes foi o processo de transformação do frasco em plástico granulado para possibilitar o reaproveitamento do material. Caio Perrone, de 8 anos, se surpreendeu ao perceber que o cano que estava à sua frente já tinha sido uma embalagem. “Vou contar para todo mundo o que pode ser feito com a embalagem e que é importante para a natureza a gente reciclar tudo que puder”, contou o aluno da 2a série. Para professora Arlene Salvatti, atividades como esta complementam o trabalho de educação ambiental feito em sala de aula. “A teoria é fundamental, mas são os exemplos práticos que realmente convencem as crianças”, afirmou. Ela ainda comentou que não foram só os alunos que aprenderam coisas novas. “Eu não sabia que a embalagem de óleo lubrificante podia ser entregue ao posto. Eu sempre separava em casa, junto com outros plásticos. Mas a partir de agora não farei mais isso, irei ao posto, que dará a destinação adequada”, disse. Para conscientizar as crianças sobre a importância da reciclagem, o programa Desperdício Zero, da Secretaria do Meio Ambiente, distribuiu materiais como o Passatempo, uma revistinha feita com papel reciclado que traz atividades como palavras cruzadas e jogo dos sete erros abordando a separação dos resíduos. “Cada escola que participou do evento também levou para sua biblioteca um exemplar da “Versão Verde”, uma compilação com mais de 500 páginas com informações sobre o reaproveitamento dos mais diversos materiais’, ressaltou o coordenador do Desperdício Zero, Laerty Dudas.